Full Sail Partners is pleased to announce that Deltek has named our firm a Deltek Platinum Partner, the highest Deltek partnership tier. Deltek Platinum Partners provide sales, implementation, consulting, support and customization services for project-oriented professional services organizations and are required to meet and maintain a number of standards with respect to sales and marketing goals. 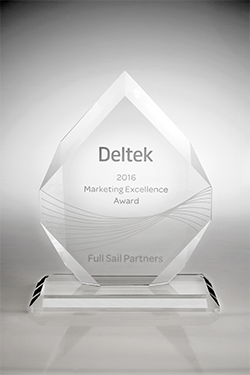 Full Sail Partners is also the proud recipient of the Deltek Vision Partner Marketing Excellence Award for 2016. Deltek Vision is a leading enterprise software solution designed for project-based professional services firms to improve business performance, streamline operations and win new business. Deltek Vision uniquely integrates end-to-end business processes by automating the marketing, financial management, planning, tracking and administration of resources and projects. In 2017, Full Sail Partners will continue to partner with Deltek to help businesses integrate their processes into one singular system, better understand and retain current customers, and increase market share. Additionally, we will continue to collaborate with industry agnostic solution providers and create repeatable integrations for Deltek Vision to allow users to connect their system to other software solutions with the Blackbox Connector. “We are pleased to distinguish Full Sail Partners as a Deltek Platinum Partner for 2017, and to honor them with a Marketing Excellence Award. The enthusiasm and focus that Full Sail Partners brings to our partner ecosystem helps Deltek to provide optimal services and solutions to our mutual customers,” said Ray Lazarine, Senior Marketing Director at Deltek.